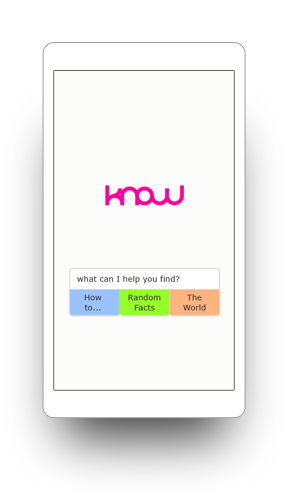 know is a concept for a better search engine I created during a 12-week user experience design immersion course at General Assembly Chicago. My digitally-focused profession has required me to look for highly technical information over the course of my career, and it's sometimes been difficult to find the answers to my questions. I decided there must be a better way to search for information on the internet, and so I created know. 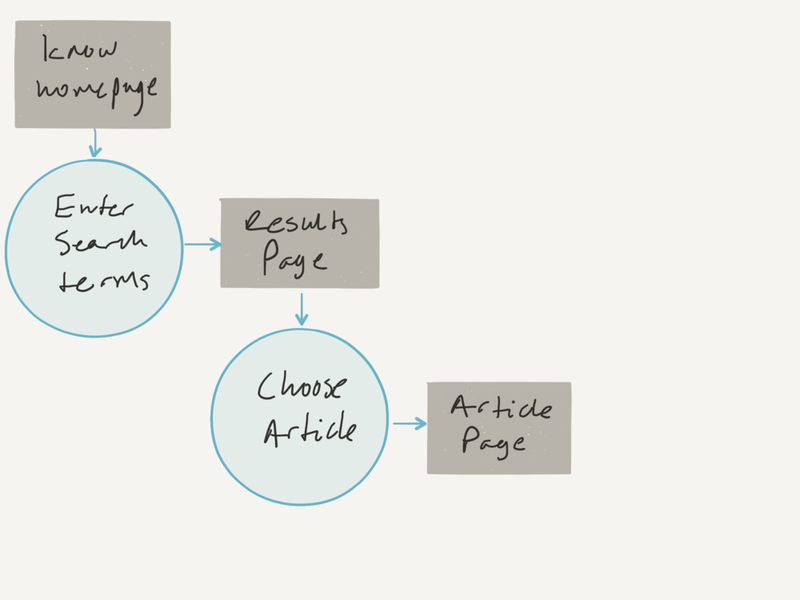 My initial sketch to capture my idea, establish purpose, and document my first thought for the user interface. Finding specific information and training online is too difficult. Leveraging relational data, user-generated content, and modern indexing technology to improve the process of finding information online. In order to gain a basic understanding of user perception towards searching for information online, I asked several people a two-pronged question: How do you feel about searching for things online, and what do you if you don’t find what you want right away? The answers to these questions led me to understand some interesting behaviors, including a persistence to find what they're looking for, thresholds where users give up, and general curiosity for towards surrounding environment. In order to understand how my users might approach my content, I designed an open card sorting activity of 24 different items. The items spanned popular culture, activities, historical events, landmarks, old wives' tales, measurement conversions, and more. I ran my card sort with five participants, who identified seven possible named groupings for the inventory, which I was able to synthesize into three common themes. To check my process, I revisited my participants and asked them if the categories I'd created from their results still made sense to them. In order to understand how I could differentiate know from other online learning resources, I conducted a competitive analysis of well-recognized tools to find news, historical data, random information, and technical information/skilled knowledge. I decided that my biggest challenge would be to compete with Google because of its market reach and brand recognition, and Wikipedia because of its brand recognition and established tenure in the user-generated content space. Besides those facts, Wikipedia tends to rank well on Google results listings. I wanted to make sure I stayed focused on the wide range of needs and preferences users of the internet have. I created four personas to help me do it: an experienced professional with a high level of education, a skilled entrepreneur looking for inspiration, a graduating high school student trying to choose a college to attend, and an elementary school student who needs resources to finish her homework quickly. Based on my observations, conversations, and experience working with students in classrooms, I measured all of my personas against the same four segments: internet experience, technical expertise, education, and time. This helped remind me to consider the needs of the savvy while exceeding the needs of the inexperienced. With the results of my card sorting activity under my belt, I had a solid understanding of what the information architecture of the website would be. I envisioned my strategy as a broad lens of interconnected content that refined through continued user interaction. While I set out to improve the search process, I knew I was adding steps. Therefore, I wanted to ensure the basic use cases of know could be executed in as few as two steps. A couple of our working sessions were focused on user testing, which gave me time to create some basic sketches based on my perception of what would help my personas, match my information architecture, and follow my user flows. I built an interactive prototype using InVision and had my classmates give me feedback on my process and results. As I began to decide what know would look like, I wanted to focus on accessibility. I chose only colors that met contrast requirements per the Web Content Accessibility Guidelines (WCAG). This decision sacrificed a little bit of modernity, but user accessibility trumps design aesthetic. When I was creating the wordmark, I was inspired by the interconnected nature of know's content. know would depend on the relationship between individual pieces of content, as well as the content and the user in order to make it a useful index. I was very passionate about carefully documenting wireframes at the global level, because I believed it would—and did—make the visual design process easier. As I begin to think about functionality and detail in a design, I prefer to create paper copies first. It helps me think more flexibly and not get caught up in the possibilities of the computer, instead just focusing on the experience. Once I've finished a clean sketch, I move on to making comps, or annotated wireframes in this case. The intention of the final presentation of our class was to share how far we'd come in our process. Since I chose to focus on thorough research, user testing, and design documentation, the visual design of the entire user flow was not complete. My concept as a whole was sound, however; a user experience design principle from a consultancy in Chicago was impressed simply asked me if I was going to execute my project in the real world. Maybe someday, but for now, this is know.